Woooo! Man what a great way to get fired up for a bachelor party! 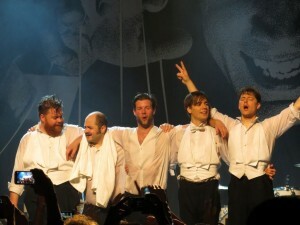 I hit up Emo’s on February 21st to see The Hives for the second time. The opening acts helped support the banging, but it was The Hives that totally came through and jazzed me up for what ended up being a non stop abuse of all things excess. I can’t believe I actually remember some of this so just bear with me and help me relive this outbreak. I keep getting confused. Is it Emo’s East, the New Emo’s, or just Emo’s I have no clue so from henceforth, it will be called Just Emo’s. And it really is. I seem to remember a better beer selection there but apparently it waned out. Oh well, I wasn’t really looking for something crafty, but I coulda used something more than what they have. I was there to see some music. First up was The Act Rights. I had to go back and listen to this song to get a good idea. Very sweeping rock music. It’s a little different but it doesn’t evoke any special emotion in me. If anything, warm up perfectly fits. Sweeping between a couple of hard rocks solos and then sweeping back to some rhythms. Works for me. Flesh Lights were up next and we went from sweeping to seizures. I think I get the lineup now. The rock n’ roll good times of The Act Rights mixed with the obvious punk of the Flesh Lights culminates into our final Main Offender. Yes, these guys moved the punk needle. And while I’m not totally punk, I do appreciate more of the raw sound and not the lame-o mainstream sound. Finally, we got The Hives. I barely remember them from a looong time ago but it was right around their first big phase here in the US. Much has happened since and they seem to have dropped off the radar for me and the rest of the states. It didn’t matter much to them though as they came out and totally owned the crowd. That all goes to the grandiose bombasity of lead singer Howlin’ Pelle Almqvist. The cocky was charm and he had everyone hovering about the basket. The songs, of course, were that garage punky rock and roll that has always been their sound. One can’t help but bob their head at near bangin’ speed during songs like Main Offender or Walk Idiot Walk. The neck even hurt a bit afterward. If ever there was a way to concentrate the energy from these acts and condense it into a tasty drink, the barker of that product would rake in millions. I felt like I had ingested ample amounts and it carried through the bachelor party in Las Vegas. The best part: this was the only drink that didn’t give me a hangover.